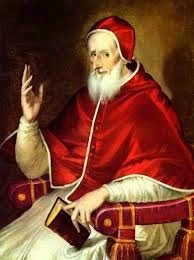 Pope St Pius V "whoever receives the one I send receives me"
receives me, and whoever receives me receives the one who sent me." "Holy Orders is the sacrament through which the mission entrusted by Christ to his apostles continues to be exercised in the Church until the end of time: thus it is the sacrament of apostolic ministry. It includes three degrees: episcopate, presbyterate, and diaconate. Thursday in the Octave of Easter: "Why are you troubled?"